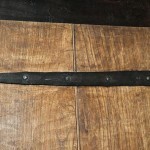 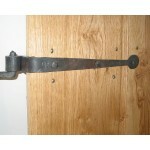 In the Hinges section of the shop I offer two sizes of forged strap hinge as off the peg items. 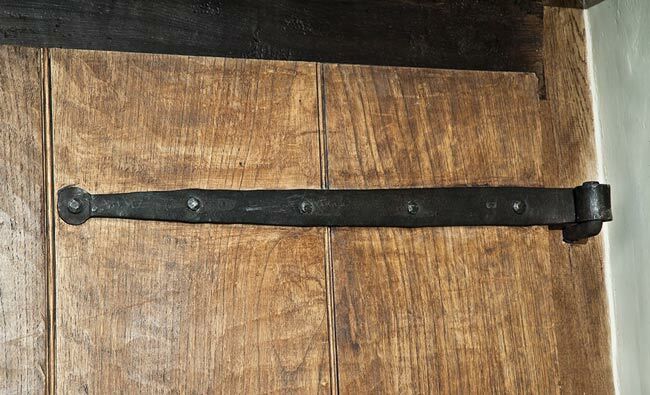 Their design and crafting are totally traditional but I feel that the possible variations are too numerous to attempt production of a comprehensive range of forged straps. 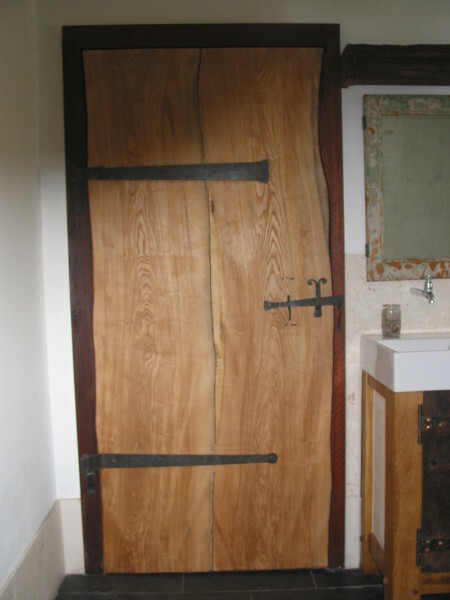 Even plain, traditional strap hinges tend to be a bit more bespoke than ‘plate’ hinges, with more variables to be considered; there are the basic traditional forms – the leaf and button end – but then there can be varieties of shape – parallel sided or tapered -, variety of finial and decoration and then, of course, a number more choices when one gets to the business end and the pintles and relation of surfaces of door to frame or wall- not to mention the issues around fixings and fastenings. 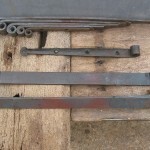 I can forge for you straps of pretty much any size and configuration, with all the necessary hardware – pintles, nails etc. 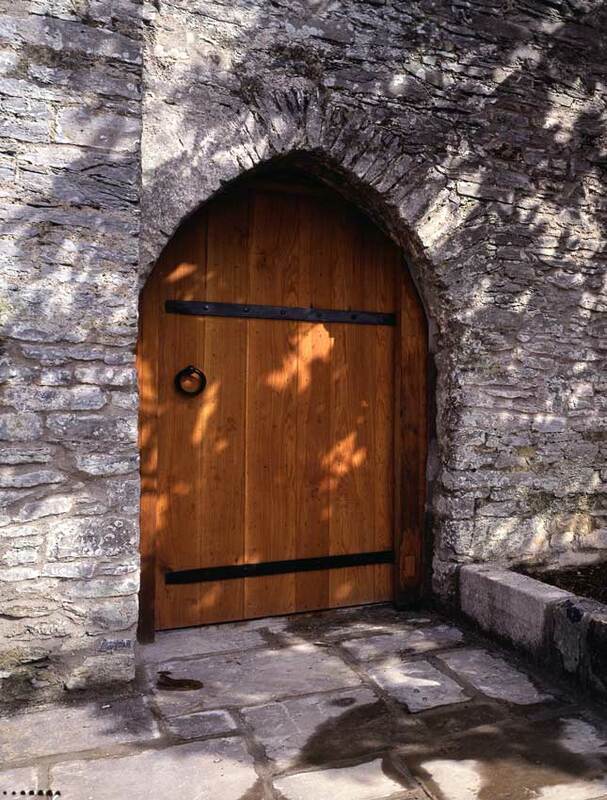 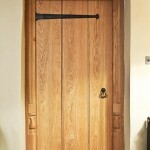 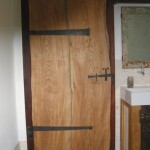 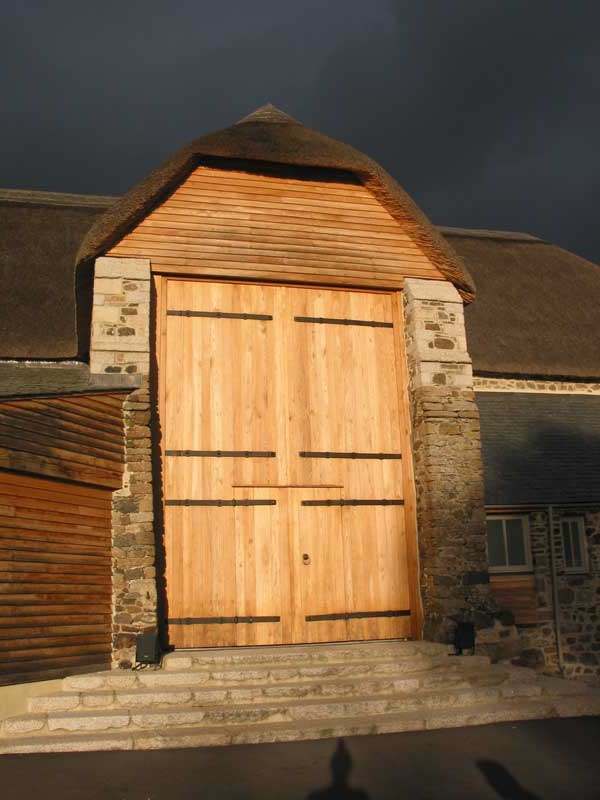 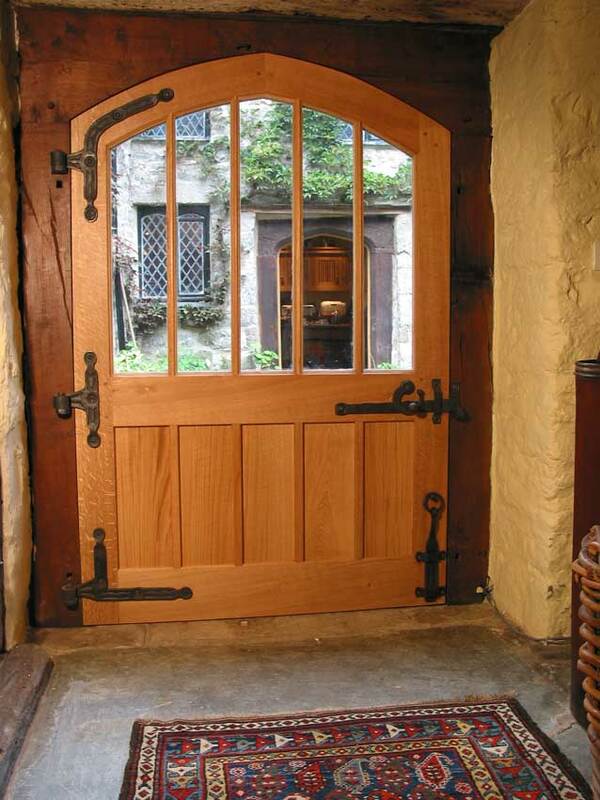 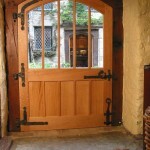 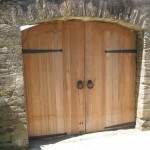 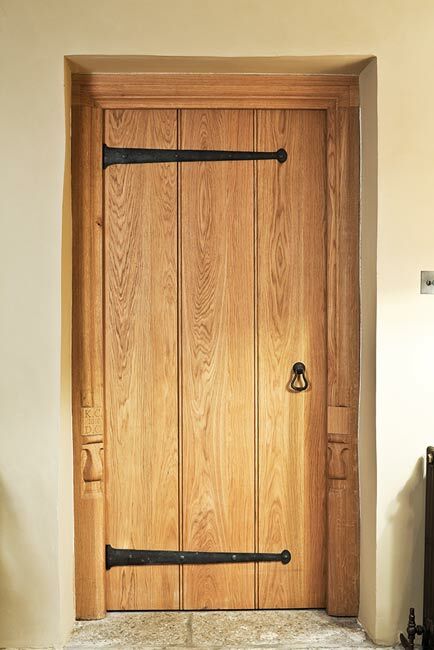 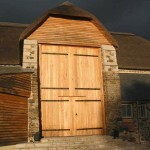 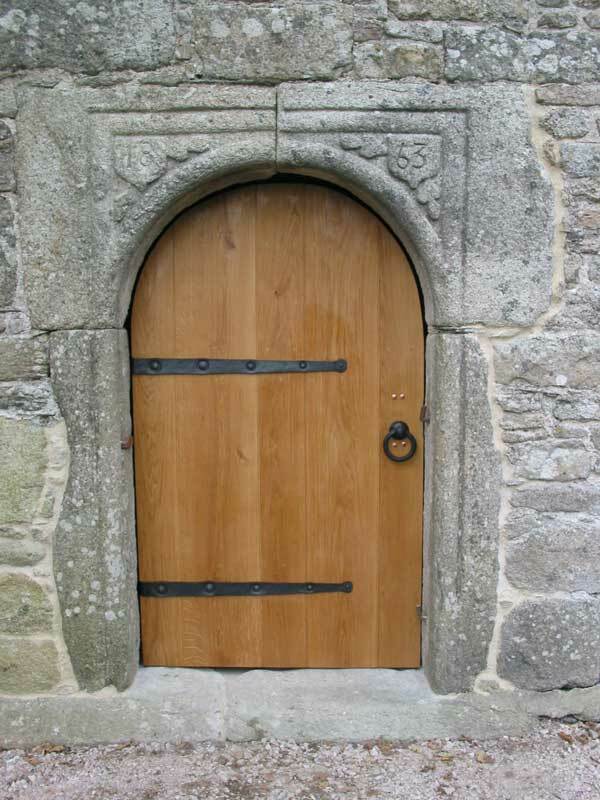 – I do need a certain amount of detail (see bottom of page) in order to be able to arrive at good solutions, but then I would say that beautiful doors, old or new, have just got to be worth the bother. 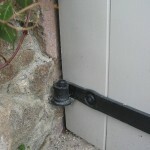 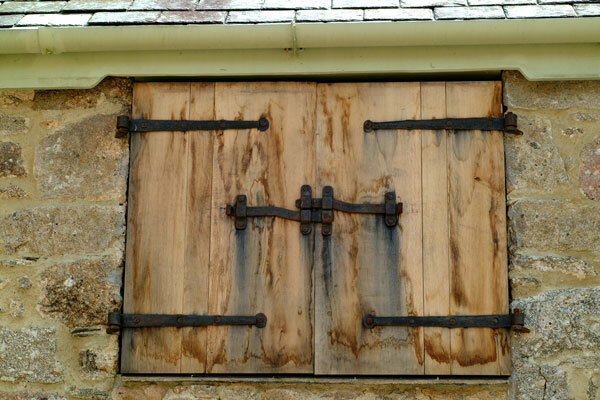 Many of these hinges have been nail fastened. 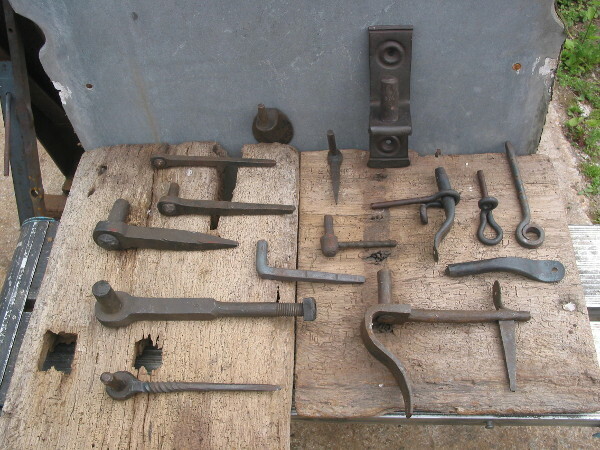 I make nails and clench nails for the ironmongery I supply as well as supplying appropriately finished fixings of mass produced origin. 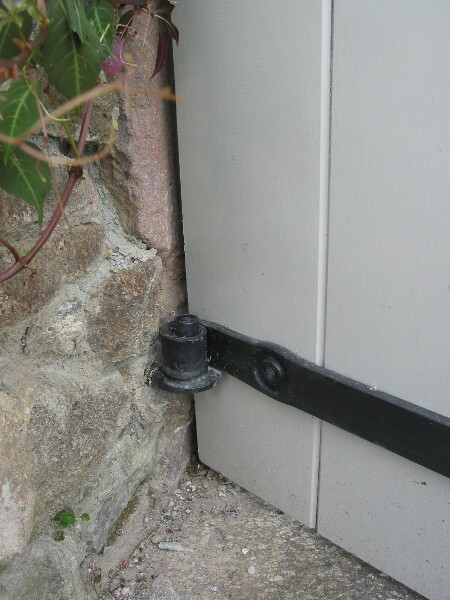 The fastening of ironmongery requires close attention to detail in both design and making and is, in my opinion, completely central in the quest for good results. 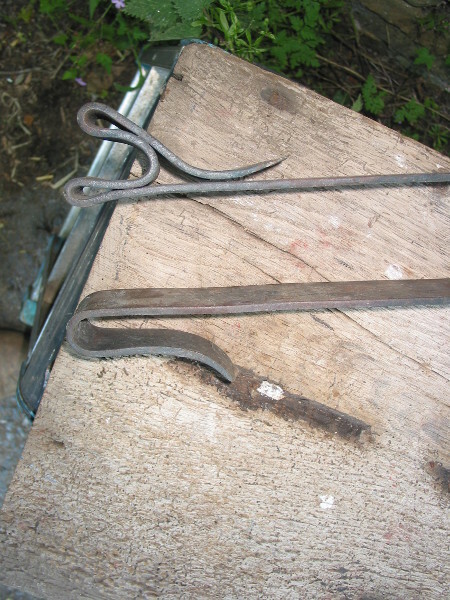 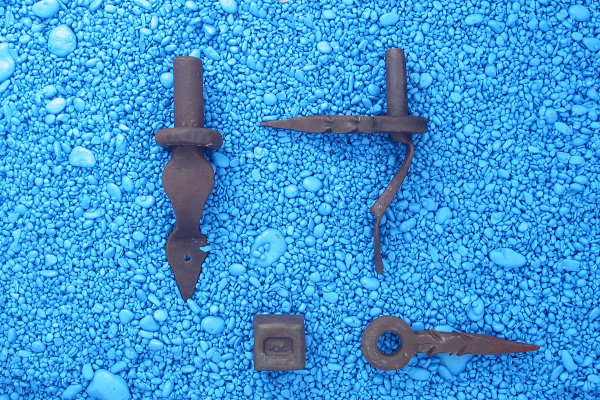 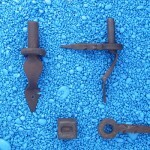 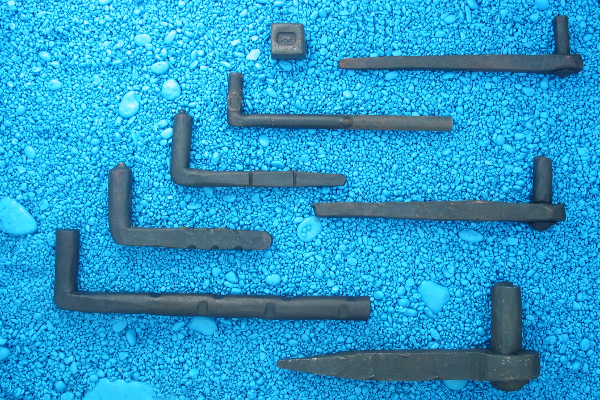 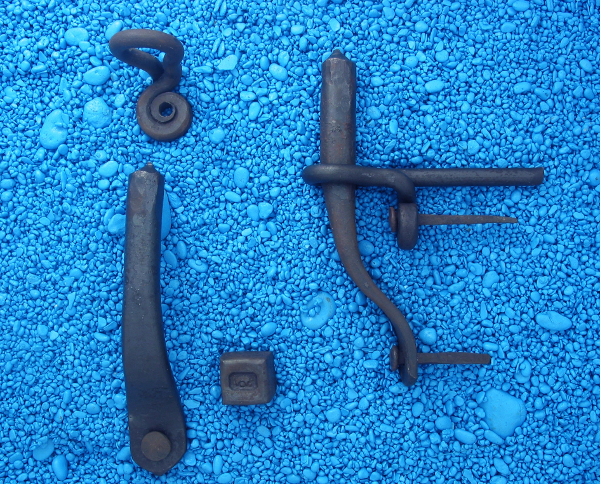 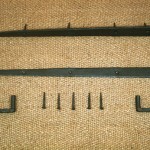 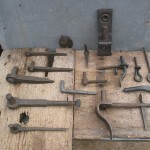 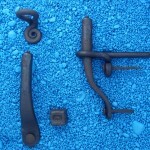 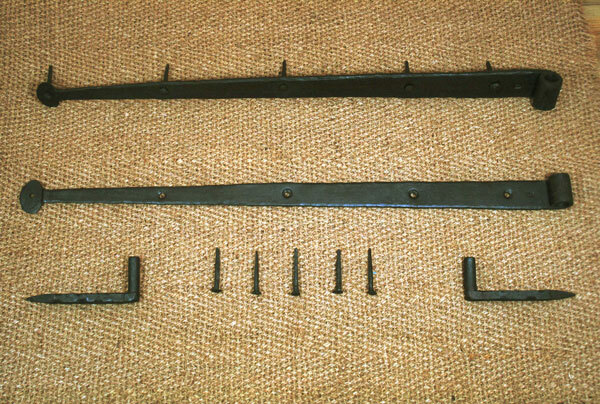 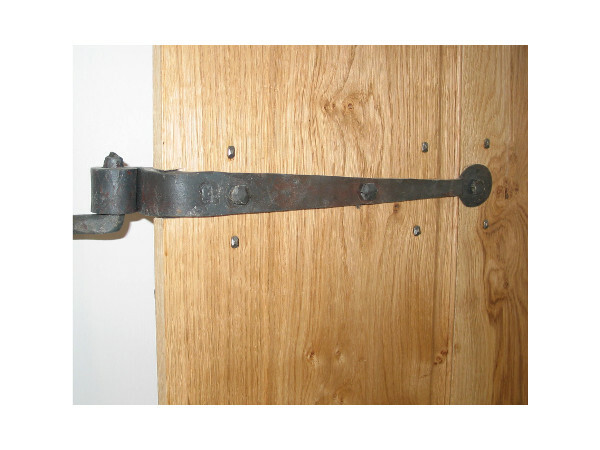 Illustrated below; Left hand image, top left a decorative square headed stud for a studded castle type door; the next two, going clockwise, are ribbed nails that we make for situations where clenching is not considered desirable; the forged ribbing aims to act in the same way as the machined rings on the shanks of ‘gripfast’ nails but the heads are slightly more interesting. 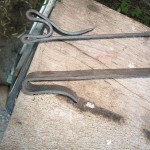 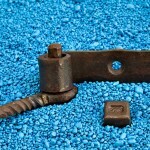 The fourth nail is designed for the fixing of large strap hinges; the nails are driven in at angles opposed to each other so that the ironwork cannot pull off or work loose) and the last blow makes use of the thinned section of shank under the head to allow the nail head to be driven down flush to the surface of the hinge. 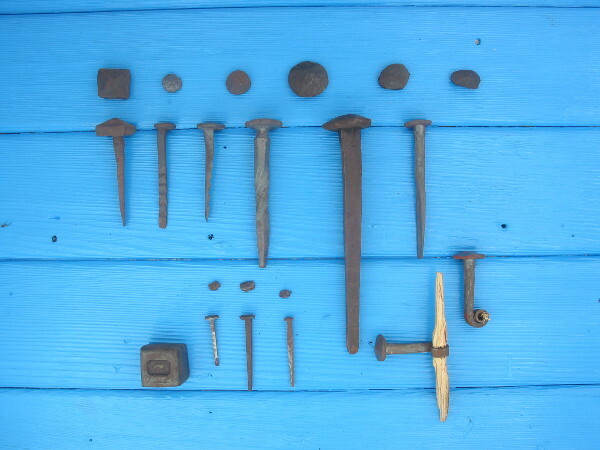 Then there is a large spike or dump and, on its’ right, a 70mm clench nail with, beneath it some clench nails that we used and then split out of the wood to see what they had done out of sight. 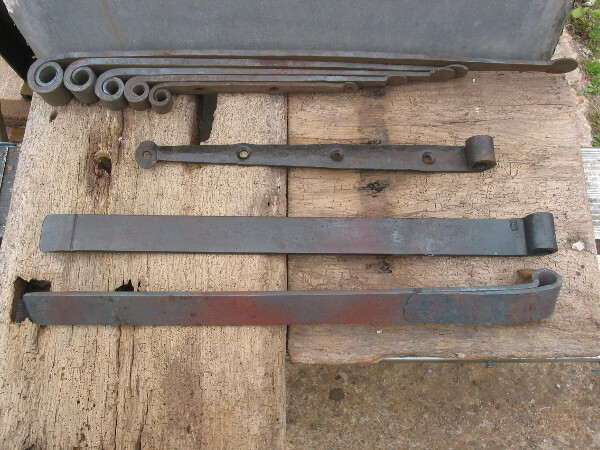 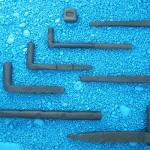 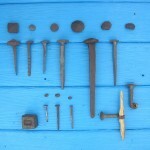 The three little nails are cut nails (40 mm and 30mm ) with reworked heads flanking the machine made rosehead in the middle. 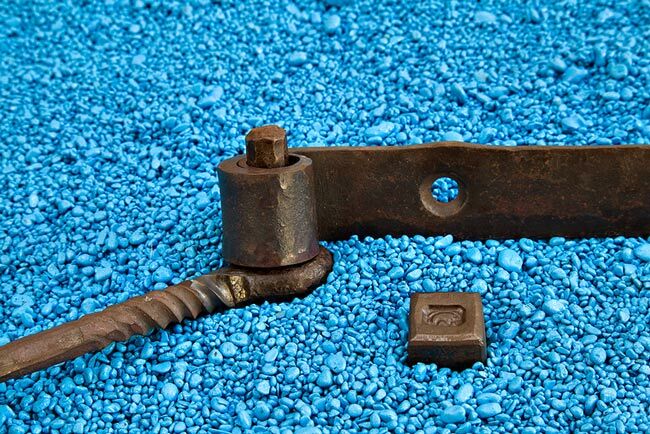 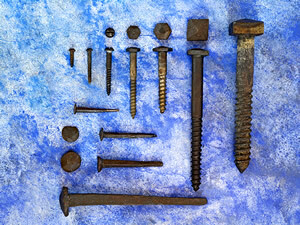 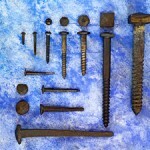 The second picture documents a few variations of coach screws with reforged heads as well as a few sizes of nail and some distressed dome head screws – all strategies that we use as required to achieve satisfactory fixing details. 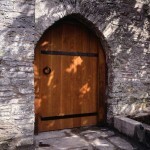 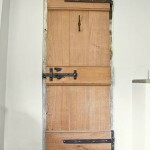 The relation of the door to the frame or wall. 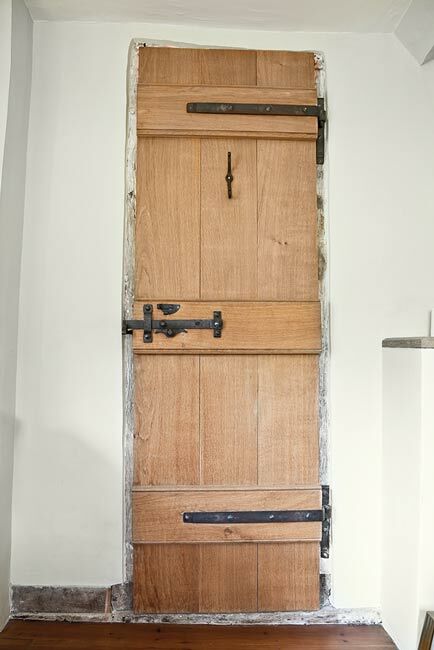 On which face of the door do you want the straps to be? 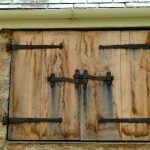 Are the pintles to be set into masonry or timber? 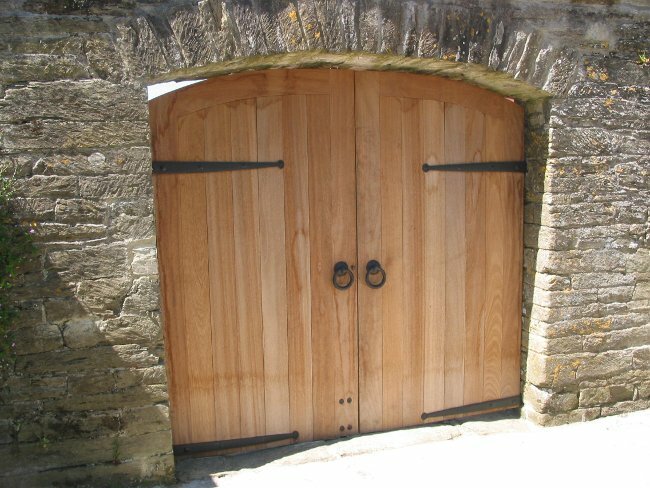 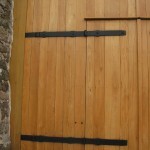 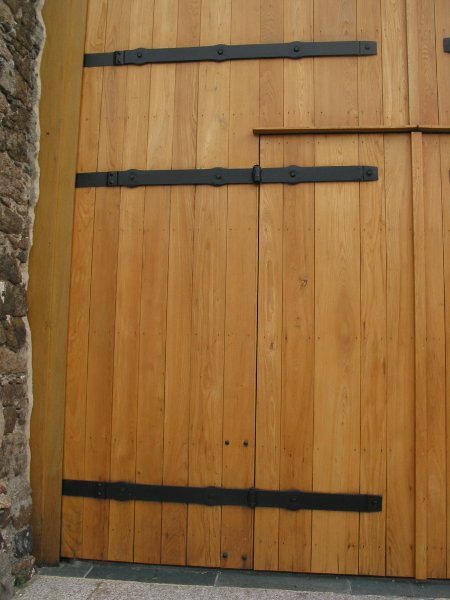 What are the widths of the door planks (so that the fixing holes are not on the joints) and the thickness of timber at point of fastenings?